Every major disaster throughout the entire world represents sudden local emergency conditions where loss of life, limb, property, necessary resources and even the ability to call for help have been forced upon people somewhere. When the news story breaks and we hear about it in the midst of our daily lives, the story is about the event itself and the extensive upset to life at the scene. However, somewhere in those initial reports, you usually hear that it was some local ham radio operator who was first able to re-establish communications and get out the call for help. They're usually first, they're usually there, and they usually get it done! In our country, these reliable, highly trained, and dedicated amateur radio or "ham" radio operators are the same people you know as friends and neighbors. Amateurs they are, as they receive no pay or compensation for the services they eagerly provide in such times of crisis. The pure satisfaction of provisioning extremely effective civil emergency communications is their fulfilling reward. You'll recall that it was ham radio operators who provided the first communications downtown on 9/11 when the WTC disaster eliminated electric power, radio, television, and even NYC emergency communications were disrupted. 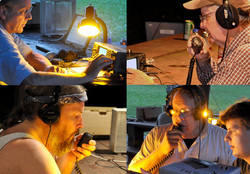 Hams established communications within a few hours, while it was days before anything else approached normal. And that was right here at home! Amateur Radio ("ham") Operators must be trained and skilled in many aspects of communications and radio technology in order to pass strict federal licensing examinations to earn their Federal Communications Commission issued licenses and radio "call sign." In very real terms, they are anything but amateur in the performance and utilization of their skills. They own and maintain their own radio equipment and are responsible for all aspects of the operation of their radio stations, whether it is from a fixed base location, a mobile station, portable station, or from aircraft or marine locations. Hams have built, orbited, and operated their own satellites since 1961, only 4 years after the world's first satellite, Sputnik, blazed the skies. Hams are for real, and they are an incredibly valuable asset to the world, all the time! Why use Amateur Radio? The answer is simple and obvious, and it’s because amateur radio equipment is independent of commercial radio services like telephones, cell phones, and even Police, Fire, and EMS service radio services, which are very limited in frequency and interoperability. Ham radio (Amateur Radio) is inherently frequency agile and readily portable, thus it is ideal for emergency dependability. Many hams are able to pick up and go, and set up communications on a moment's notice from almost anywhere. Many do just that for the enjoyment of it. You'll see hams in the parks and around towns providing supporting communications for public events like parades, marathon runs, etc. Such events are easy practice for hams, yet major events like the Boston Marathon and the New York Marathon critically depend on them because hams get the job done.When a disaster strikes, having communication breakdowns or sporadic, unreliable communications can seem to be just as much or more devastating than the actual disaster itself.